In order to organize the tours for the solar eclipses of Monday 2005 October 3 (annular) and Wednesday 2006 March 29 (totality phase during 4 min 07 sec), several inspection visits in Libya and over a year of groundwork were necessary. The total solar eclipse was marvelous as shown in this quick 2006 March 29 report. 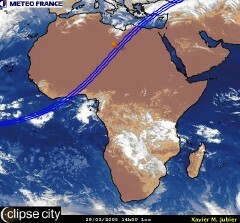 The greatest point of eclipse in 2006 lies just on the border between Libya and Chad, on the Libyan side. 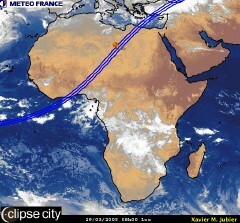 Moreover, this is the location in the totality path where the weather forecasts are the most favorable. Therefore a cosy village, for about one thousand favored eclipse chasers, will be built there to take advantage of this marvelous landscape having the best odds to view the 2006 total solar eclipse. The first run promotional movie below will show you the village that will be built deep in the desert only for this eclipse. To view the eclipse tours and prices please use this link (book soon space is going fast). Some of our tours are also proposed by our french reseller (in French). An International Symposium on solar Physics and Eclipses will be held during three days inside our Waw an Namus viewing site. Additional side trips are also proposed. To (limited space left) and drop a word or two in my Guest Book. You can download the recently published Lonely Planet Libyan Eclipse 2006 Highlights Pack . This document contains information on Libya and the 2006 March 29 total solar eclipse where "Eclipse-City" is mentioned on pages 11 and 22. The movie is also available for high-bandwidth in 640x480 (77.2 MB), or on DVD. Don’t hesitate to ask for it. Hoping to have convinced you to join us on this wonderful adventure, thank you for your visit. Page 1 | Page 2 | This is page "Eclipse-City" | Page "Cloud Cover over 15 years" | Page "Google Map" | Page "Important News"
Last page update on March 29, 2005.